We all know that money doesn't grow on trees. And we all know that money doesn't fall from the sky, either. Comics cost money. A lot of money. And this is shaping up to be one of the biggest years in comics to date. So what I've decided to do was comprise a list of comics due to come out over the next year, be they hardcover, trade paperback, or event titles. Some of them may require a little Wikipedia trip to catch up on events you missed. While these comics are my personal choices, do not feel obligated to buy them.These are the ones I believe will be worth the tag, and if you agree, you should start saving your money. This is Marvel's big event for 2012. It will feature just about every big name under the Marvel banner, with the two of the biggest teams in comic book history set to duke it out. If you read the Point One one-shot issue in late 2011, then you know what the basic premise is. The Phoenix is speeding back towards Earth to find a new host. Most people will assume that the host in question is Hope Summers, the first mutant born after M-Day that led to the most of the X-Events since the mid 2000's. There are two different opinions of Hope, some seeing her as the Mutant Messiah, and others who believe she will bring about the end of the world. Many comparisons have been made between Hope Summers and Jean Grey, the original host of the Phoenix. Both are red-haired, green eyed psionic powered mutants. With Hope's ability to mimic other mutants powers with just a thought makes here extremely powerful and possibly dangerous. There have been numerous hints to Hope eventually being in possession of the Phoenix Force, and this seems to be what the main premise is for the Avengers vs. X-Men event. There are many things that make this event an intriguing one. First off, it involves the Avengers, which are made up of some of the most powerful heroes on Earth, which include some past and present X-Men, including Wolverine (serving on two Avengers teams), Beast, and the newest Avenger - Storm. Also, the year-miniseries "The Avengers: Children's Crusade" apparently will also lead into the event, made apparent by the image of the Scarlet Witch with Hope Summers on Issue 1. Secondly, each of Marvel's "Architects" (Brian Bendis, Jonathan Hickman, Matt Fraction, Jason Aaron, and Ed Brubaker) will have writing duties on the event. Each of these writers has experience writing for the X-Men, the Avengers, or both. Bendis has been writing the Avengers for most of the last decade, Hickman has experience with his fantastic run on Fantastic Four, Fraction has experience with Iron Man, Thor, and wrote the entire Fear Itself main titles. Fraction also has experience on the X-Men as well, writing for Uncanny X-Men, Second Coming (introducing the grown-up Hope Summers), and writing Generation Hope. Jason Aaron has been incredible during his run on Wolverine, doing wonders for a character that has been overly exposed in the last decade or so. Brubaker is a legend for his work with Captain America and Daredevil, and has experience writing the X-Men too. Brubaker is currently writing the Avengers: X-Sanction title, which returns Cable (Hope's adoptive father) to present to take down the Avengers. Finally, there's Hope and the links and comparisons to two other Marvel mutants, the Scarlet Witch and Jean Grey. The Avengers and the X-Men know far too well what can happen when someone too powerful has their power go unchecked. The Scarlet Witch whittled down a species of millions to less than 200 when she spoke the words "NO MORE MUTANTS". Those three words have had a lasting effect on the Marvel Universe for most of the decade, bringing about the House of M event, Decimation, and helped spawn the events that led to Marvel creating Hope in the first place. If it hadn't been for the Scarlet Witch, we may not have ever gotten events like Endangered Species, Messiah Complex, Second Coming, leaving us to wonder where the X-Men would be today. 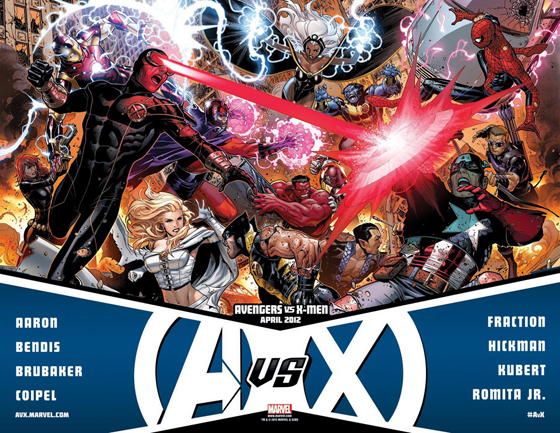 Even now, the X-Men and Avengers are fighting in Avengers: The Childrens Crusade over the fate of Wanda Maximoff. Even before that, a grief-stricken Witch killed several Avengers during Avengers: Dissassembled, including Hawkeye and her android husband, the Vision (who recently returned). Then there's Jean Grey. The first X-Man to be empowered with the Phoenix Force. Scott Summer's first true love. Jean has risen and died more times than most comic book characters. Not only does Hope bear a striking resemblance to Jean Grey, but her psionic powers only further that comparison. Who better than another red-haired, green-eyed psionic mutant for the Phoenix to take over. Coupled with Hope's power to mimic other mutants power, and you have a truly scary-powerful being to deal with. For those who don't know, Jean Grey (possessed by the Phoenix) destroyed an entire star system, killing billions of sentient beings. Earth would be a fairly easy target to destroy. So there you have Part 1. Stay tuned for Parts 2 & 3 coming soon! Until then, Peace!